SUMMER IN KINGSPORT: Sunshine, warmth, blue skies, beaches and picnics! Want to get Fit & Fabulous and have fun too? We are excited to offer you a variety of programs at the Lloyd Memorial Centre, Kingsport! Beginner or more advanced, younger or older, we have something for you! Join us - we have a space reserved just for you! Mon, Wed and Fri: 9-10 a.m. Ongoing during summer. A combination of cardio and strength exercises for all ages and abilities. Flexible, non-competitive program, personal or one-on-one support available. Circuit training exercise at Friday class. Drop-in fee: $4.00 a class or $25 for 8 classes. First class free! Instructor: Christine Heap. There will be no evening circuit training classes on Tues and Thu during the summer months. Classes to resume in September. Watch for dates & times. Mon: 5:30-6:45 p.m. Gentle Vinyasa flow, focusing on breath while building strength and flexibility. Ongoing. Additional yoga classes will be offered beginning Sept. Cost: $45 for a 6-week session or drop-in fee of $10.00 a class. Instructor: Melanie Amos. Contact Christine Heap (582-1624) or Melanie Amos (582-7700) or email: kingsportfitnessandwellness@gmail.com. See our blog at: kingsportfitnessandwellness.blogspot.ca for updates and schedule changes. 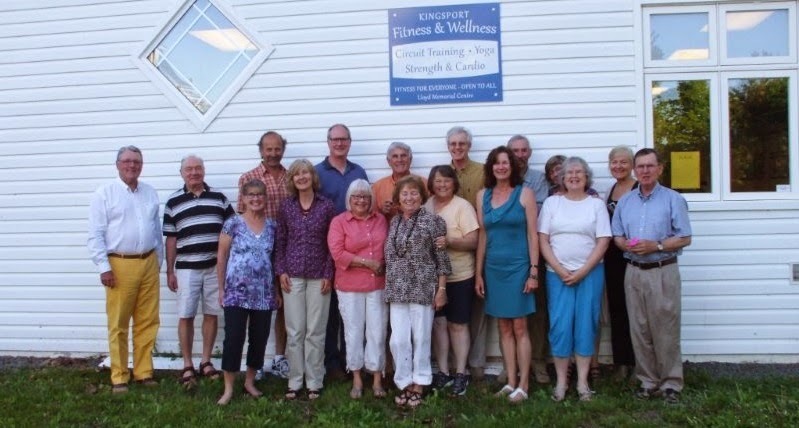 **Join the Kingsport Fitness & Wellness Society: membership: $5.00/year includes a 10 % discount at SportChek and an opportunity to contribute your ideas and suggestions. New members always welcome. Sat, Sep 20: 9:00am-12:00 p.m. at the Lloyd Memorial Centre, Kingsport. Information session and demonstration classes. Come and try some of the programs and equipment offered by the Kingsport Fitness and Wellness Society! Meet our instructors as they guide you through short 30 min fitness and yoga classes. Classes at 9:30-10, 10:15-10:44 and 11-11:30 a.m. No charge. Refreshments provided. All welcome.